Home » British Politics » DONALD TUSK: The Philosophy of having a cake and eating it is over. 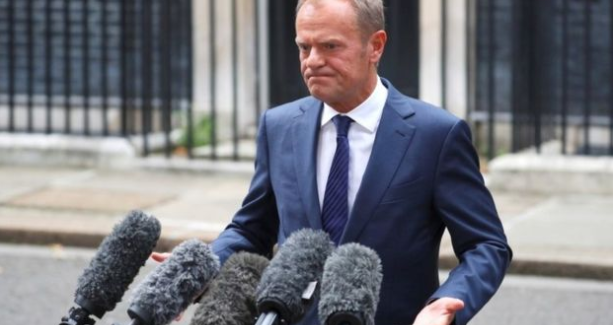 DONALD TUSK: The Philosophy of having a cake and eating it is over. This shows that the philosophy of having a cake and eating it, is finally at an end. At least I hope so. That’s good news. The European Council president Donald Tusk’s statement outside Downing Street after the Meeting with Theresa May today 26th Sept.
“I feel cautiously optimistic about the constructive and more realistic tone in the prime minister’s speech in Florence and of our discussion today. But of course no-one will ever tell me that Brexit is a good thing because as I have always said, in fact, Brexit is only about damage control. And I didn’t change my opinion. I feel now we will discuss our future relations with the UK once there is so-called sufficient progress. In October, the European Council will meet to decide if there is sufficient progress, a condition stipulated by the EU as a requirement to discuss trade and future relationship with the UK.